I believe commenting code is important. Most of all, I believe commenting is misunderstood. I tweeted out the other day that "I hear conflicting opinions on whether or not you should write comments. But I get thank you's from junior devs for writing them so I'll continue." The responses I received were varied, but what caught my eye was that for every person agreeing that commenting was necessary, they all had different reasons for believing this. Code can describe how, but it cannot explain why. This isn't a new concept, but it's a common theme I notice in helpful comments that I have come across. The ability to communicate something that the code cannot, or cannot concisely. All of that said, there is just not one right way or one reason to write a comment. In order to better learn, let's dig into some of the many beneficial types of comments that might all serve a different purpose, followed by patterns we might want to avoid. This doesn't describe what the code below it will do. It doesn't describe the actions it will take. But if you found a more elegant way of rewriting this function, you could feel confident in doing so because your code is likely the solution to the same problem in a different way. Because of this, less maintenance is required (we'll dig more into this further on). If you found a better way to write this, you probably wouldn't need to rewrite the comment. You could also quickly understand whether you could rewrite another section of code to make this function unnecessary without spending a long time parsing all the steps to make the whole. When you look at a long line of regex, can you immediately grok what's going on? If you can, you're in the minority, and even if you can at this moment, you might not be able to next year. What about a browser hack? Have you ever seen this in your code? The first one targets Chrome ≤ 28, Safari ≤ 7, Opera ≥ 14, the second one is Firefox versions 2-3. I have written code that needs something like this. In order to avoid another maintainer or a future me assuming I took some Salvia before heading to work that day, it's great to tell people what the heck that's for. Especially in preparation for a time when we don't have to support that browser anymore, or the browser bug is fixed and we can remove it. Who's smart? We are! Who writes clean code? We do! We don't have to comment, look how clear it is. The problem with this way of thinking is that we all have deeper knowledge in different areas. On small teams where people's skillsets and expertise are more of a circle than a venn diagram, this is less of an issue than big groups that change teams or get junior devs or interns frequently. But I'd probably still make room for those newcomers or for future you. On bigger teams where there are junior engineers or even just engineers from all types of background, people might not outrightly tell you they need you to comment, but many of these people will also express gratitude when you do. If this very article was written as one big hunk rather than broken up into sections with whitespace and smaller headings, it would be harder to skim through. Maybe not all of what I'm saying applies to you. Commenting sections or pieces allows people to skip to a part most relevant to them. But alas! You say. We have functional programming, imports, and modules for this now. It's true! We break things down into smaller bits so that they are more manageable, and thank goodness for that. But even in smaller sections of code, you'll necessarily come to a piece that has to be a bit longer. Being able quickly grasp what is relevant or a label for an area that's a bit different can speed up productivity. Then I can easily focus on one thing at a time. But when left in your code as is, these comments can be screwy to read later. They're so useful while you're writing it but once you're finished can merely be a duplication of what the code does, forcing the reader to read the same thing twice in two different ways. It doesn't make them any less valuable to write, though. My perfect-world suggestion would be to use these comments at the time of writing and then revisit them after. As you delete them, you could ask "does this do this in the most elegant and legible way possible?" "Is there another comment I might replace this with that will explain why this is necessary?" "What would I think is the most useful thing to express to future me or other from another mother?" is rather helpful. As a maintainer, when I run across comments like this, I'll save buckets of time trying to figure out what the heck is wrong with this person and envisioning ways I could sabotage their morning commute. I'll immediately stop trying to figure out what parts of this code I should preserve and instead focus on what can be refactored. The only warning I'll give is to try not to make this type of coding your fallback (we'll discuss this in detail further on). Are you a PHP shop that just was given a client that's all Ruby? Maybe it's totally standard Ruby but your team is in slightly over their heads. Are you writing a tutorial for someone? These are the limited examples for when writing out the how can be helpful. The person is literally learning on the spot and might not be able to just infer what it's doing because they've never seen it before in their lives. Comment that sh*t. Learning is humbling enough without them having to ask you aloud what they could more easily learn on their own. Did you just copy paste a whole block of code from Stack Overflow and modify it to fit your needs? This isn't a great practice but we've all been there. Something I've done that's saved me in the past is to put the link to the post where I found it. But! Then we won't get credit for that code! You might say. You're optimizing for the wrong thing would be my answer. Inevitably people have different coding styles and the author of the solution solved a problem in a different way than you would if you knew the area deeper. Why does this matter? Because later, you might be smarter. You might level up in this area and then you'll spend less time scratching your head at why you wrote it that way, or learn from the other person's approach. Plus, you can always look back at the post, and see if any new replies came in that shed more light on the subject. There might even be another, better answer later. Writing comments gets a bad wrap sometimes, and that's because bad comments do indeed exist. Let's talk about some things to avoid while writing them. is a big pain. Why? Because you're actually reading everything twice in two different ways. It gives no more information, in fact, it makes you have to process things in two different formats, which is mental overhead rather than helpful. We've all written comments like this. Perhaps because we didn't understand it well enough ourselves or we were overly worried about reading it later. For whatever the reason, it's always good to take a step back and try to look at the code and comment from the perspective of someone reading it rather than you as the author, if you can. Bad documentation can be worse than no documentation. There's nothing more frustrating than coming across a block of code where the comment says something completely different than what's expressed below. Worse than time-wasting, it's misleading. One solution to this is making sure that whatever code you are updating, you're maintaining the comments as well. And certainly having less and only more meaningful comments makes this upkeep less arduous. But commenting and maintaining comments are all part of an engineer's job. The comment is in your code, it is your job to work on it, even if it means deleting it. and refactor this code later to go from using getBoundingClientRect() to getBBox(), the comment still applies. The function exists for the same reason, but the details of how are what has changed. I've definitely seen people write code (or done this myself) where the variable or functions names are one letter, and then comment what the thing is. This is a waste. We all hate typing, but if you are using a variable or function name repeatedly, I don't want to scan up the whole document where you explained what the name itself could do. I get it, naming is hard. But some comments take the place of something that could easily be written more precisely. This is the crux of the issue for a lot of people. If you are writing code that is haphazard, and leaning back on your comments to clarify, this means the comments are holding back your programming. This is a horse-behind-the-cart kind of scenario. Unfortunately, even as the author it's not so easy to determine which is which. We lie to ourselves in myriad ways. We might spend the time writing a comment that could be better spent making the code cleaner to begin with. We might also tell ourselves we don't need to comment our code because our code is well-written, even if other people might not agree. There are lazy crutches in both directions. Just do your best. Try not to rely on just one correct way and instead write your code, and then read it. Try to envision you are both the author and maintainer, or how that code might look to a younger you. What information would you need to be as productive as possible? People tend to, lately, get on one side or the other of "whether you should write comments", but I would argue that that conversation is not nuanced enough. Hopefully opening the floor to a deeper conversation about how to write meaningful comments bridges the gap. Even so, it can be a lot to parse. Haha get it? Anyways, I'll leave you with some (better) humor. A while back there was a Stack Overflow post about the best comments people have written or seen. You can definitely waste some time in here. Pretty funny stuff. Totally agree. Comments don’t just tell you the the what, they also can tell you the why and that, oftentimes, is MUCH more important. Can’t tell you the number of times I’ve broken things because I saw some code that looked dumb to me, but actually was necessary to cater for some obscure edge case that I didn’t even know was possible. A why comment there would have been awesome. It makes navigating nested html elements or functions a lot easier… and god help you if you have to navigate a table-based email that isn’t well commented. I can see why that could seem helpful. However, in my personal experience, adding an //end can lead to people into a false sense of security when it comes to trusting that the comment is correct. If the //end is in the wrong place, it will cause issues down the line. We have indentation in code for a reason. Good readup, but I don’t agree with } // end if being bad. If you have multiple larger constructs nested, not having to scroll up 1-2 screens to find out what you’re closing here can indeed help finding your way through some code. If you have such large constructs that you can’t see them on one screen, then perhaps it’s time to refactor. Excellent article that touches on a lot of things I think are important. I’ll say I’ve personally written quite a ranting comment at the start of a class that uses the Amazon MWS API that I believe is just as useful as it was therapeutic for me. Thank you for writing this! I agree wholeheartedly that comments are necessary to explain the parts that the code itself cannot. It just saves time for yourself and others later on. First, I am NOT a coder (although I do a fair bit in CSS and XSLT). Great article (and love the comic). I just want to say that for me the main person who will read my comments will be me 6 months later. I can’t tell you how often I look at my own code and have no idea what it’s about. I am pretty good about commenting, but for CSS, most of the code is very hierarchical. Everything is underneath something else, etc. I’ve gotten to the point where I copy the hierarchies + explanatory comments on a 2 column MS word document for easy reference. Where I work we are basically forbidden from writing comments because of the book you mention. I have seen so many occasions where comments would have saved so much time. How often I hear the phrase “I know there’s a reason we did it like this, I just don’t remember why”. Nice article! :) Having posted brought the comic into the discussion via twitter in the first place (and without much explanation—sorry! ), I should probably elaborate on what it does for me. I don’t particularly agree or disagree with the sentiment, but I certainly do think about it when I write code. More than anything else, it’s a cheeky reminder to myself to write code with empathy for whoever might follow, whether that’s me in a month or a year or someone picking up the pieces of a project I’ve abandoned. 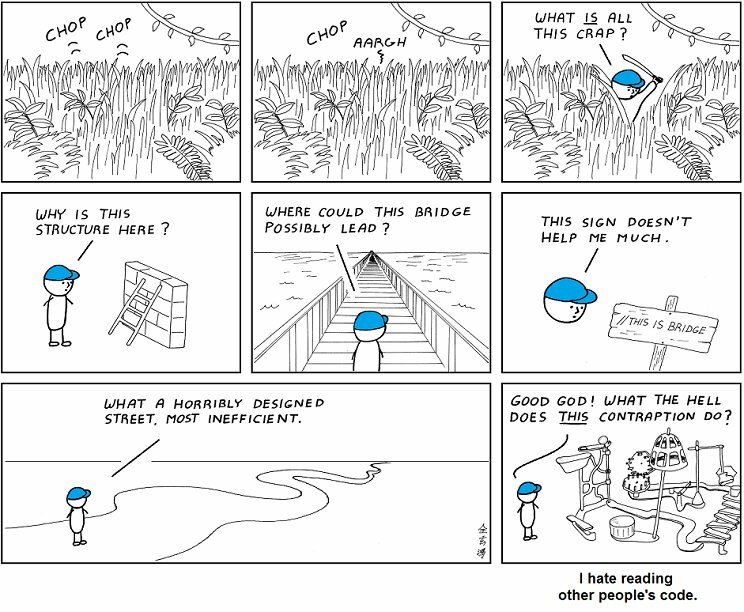 I write a comment and I ask myself, “Am I calling a bridge a bridge? Have I done anything to convey where the bridge came from or where it might be headed?” That’s all really, but it was a bit too much to explain on twitter. At least until I get my 280 characters. Whenever you go to write a comment, just refactor your code instead. If you can’t do it on your own, find someone that can help you, learn and grow as a developer. If you are worried that your code is not clear, ask someone to peer review it, discuss it and refactor if you think it would help. If you want to rant or put your personal opinions into your code… just don’t do that ever. Stop being passive aggressive. Yeah, I’ve come across both my own code and third party libraries that link to the SO article or reply that explains the reason for the obtuse block that follows the comment. Thanks for the article! I agree with much of what you’ve written. Any chance for a follow-up article on writing useful commit messages when working in a team? Excellent article on a subject that has been debated quite a bit in the past several years. Nice job Sarah, and well written.